Believed to all closed in fall 2012, except for McDonald's in early 2013 (just a guess: I don't know when that Brake Check closed, either), this is our first post outside of the Brazos Valley and into Houston, which has far more interesting things to check out (and also a destructive city in terms of architecture, moreso than College Station). But this is an exception to what we have had before, and not the norm. I was too young (and never really traveled on that part of the highway anyway) to remember the Katy Freeway expansion, which not only took an abandoned railroad right of way, but required demolition of dozens of buildings: office buildings, restaurants, gas stations, hotels, and houses, with many easily less than two decades old. Because the expansion of Northwest Freeway isn't afforded the abandonment of the railroad, many streetside buildings are simply being condemned and torn down. A tragedy. There were three restaurants wedged at the corner of Beltway 8 and 290, a Wendy's, a Taco Bell, and a McDonald's, not very visible except for their signs pointing out of the sides of the highway. I know I've passed 'em several times, back when they were still selling delicious greasy food, but never ate there myself, seeing as they weren't particularly convenient, and were often there at the wrong time or the wrong side of the highway. But for the times I did go through Houston, I passed them by. They were familiar to me. But now they are gone. 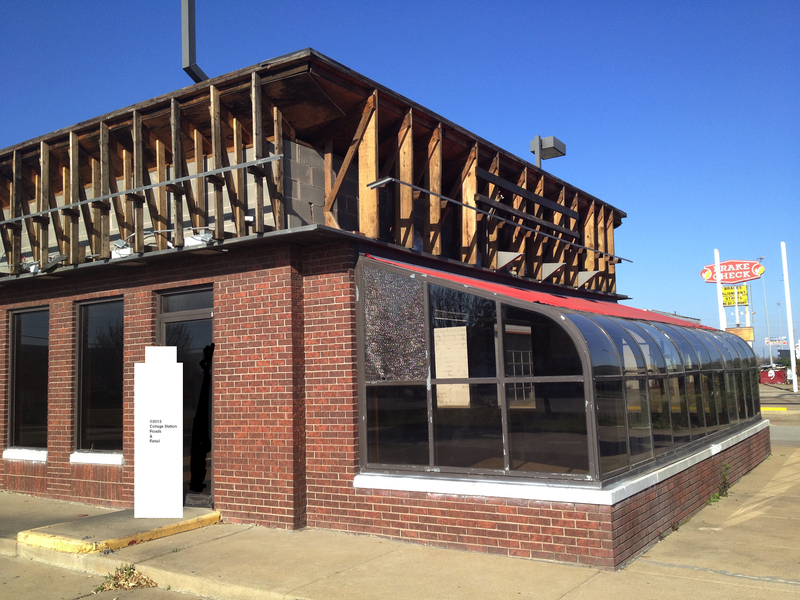 I'm guessing they were built sometime in the 1980s, seeing as how Wendy's has the "solarium" dining room. A friend and I stopped by in our travels to Houston last March. Enjoy some of the pictures. It's worth noting that we went to the dumpsters of every restaurant to see if we could snag anything, but we couldn't (maybe they went to Sparkle Signs, I know there's an old McDonald's sign there). We figured that if both pieces of a sign were intact, we could each take one, clean it up, backlight it, and mount it on a wall, creating an imposing and interesting piece of décor. It would also be a great conversation piece. But alas, we couldn't, and all we found was random trash. I have a few pictures we took, but the rest could perhaps be told another day. My friend (seen) and I attempt to order some food from McDonald's. No reply. McDonald's was repainted recently, albeit for nothing. It was also stripped up its roof and boarded up tight. Flaking paint, exposing green. Was this not originally a Taco Bell?! Inside Wendy's. Well, looking inside, anyway. This was my friend's picture. Or at least his camera. Wendy's exterior. Had to crop the person out. Aforementioned Brake Check. This was not examined terribly closely. If you enjoyed seeing Houston buildings, and would like to see even more, check out our new associate at Arch-ive.org, which explores old Houston buildings. There's no comments and there's sadly little text to go along with it, but most of the stuff is rare, the photos are great, and it updates on a more consistent basis. Edit 6/14/2013: Commenter "je" has reported that the buildings seen here have been torn down. The buildings are all gone now from this post. You made it just in time to document them before they were all gone. I wonder why they even bothered to paint the Taco Bell a solid color when they knew the building was going to come down. Nobody "knew" when it was going to come down. Plans are plans--they can come in decades down the line, or they don't. The Taco Bell repaint probably came in the mid-1990s, but that was nearly 10 years of cooking tacos. 10 highly successful years, I might add. The REI on Katy Freeway probably lasted less than 10 years before it went kaput due to the expansion.